Oh, we&apos;re just all crazy now. I&apos;m going to leave for Philly in the morning, take Ki to hang out with his cousin for the big birthday party, hang out there for a little while, and come down to the con in the late afternoon. I really don&apos;t know if I&apos;m going to be able to do any panels. I&apos;m obviously missing the one that&apos;s scheduled to start in five minutes, and the sun. pm ones are not really practical either. but given that my email asking to reschedule was not answered, i&apos;m not inclined to care. At any rate, can I say how happy I am that my hair is fun again? It was such a relief walking into the bathroom and seeing, in the mirror, someone I recognized, albeit a bit heavier. well, in about 25 minutes we&apos;ll have a new entry in the history of Helen&apos;s hair again. I&apos;m going back to auburn. Now hopefully this will assuage the urges I&apos;ve been having to chop it off. that is becoming an opus. Some 32 pictures at last count, and there are gaping holes that I&apos;m trying to track down. I even found one from 1996. There are others that we may scan. Those of you on flickr now can see what all those old pics are for. New Years Eve, 2002-3. 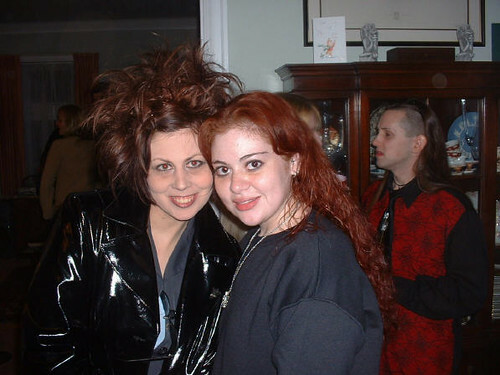 The picture that inspired “Please don&apos;t feed Helen&apos;s hair after midnight.” With Ms. Laura-Fe. The more I look at pictures from last fall, the more I realize I look better in dark auburn. Let&apos;s talk about my roots. I was offline for pretty much four days, so now I&apos;m catching up on email. You know you color your hair too much when Clairol sends you a birthday card. The least they could have done was included a coupon. The major scarcity of pictures of late is becaues my hair looks like crap. Tomorrow I am having it cut for the first time (a) in four months and (b) since my bangs reached past my chin. All of my layers have grown out too, and it really is fried. Last year I had the back this length and I cut it off into something more akin to a bob, and I&apos;m contemplating doing something similar this time but with a bona fide chinlength bob. Alternatively, I could return to layers and do something fun with it while keeping it long, but I&apos;m sick of looking in the mirror and seeing this other persona of me, the blob. Granted, I could stick with weight watchers for longer than a week and whatnot, but I&apos;m determined to get back into shape using exercise rather than obsessing over points. I do need to eat healthier, but since I ALWAYS seem to lapse back into bad habits i need to stop avoiding the fitness side of the equation. less talk, more do, helen. Anyhow. Hair cut seriously needs to improve my chi, but I&apos;m so ambivalent about cutting it. I always want to when it gets to this length, but I want long hair when DFH and I formalize our partnership. At least, I think I do. Do I? Anyhow. I could make this a post about vote for your favorite Helen haircut, but to do so I&apos;d have to post a poll with a bunch of pictures of me. I am, however, seriously considering a return to auburn for fall, another bad sign given that last year&apos;s auburn is good and grown out and highlighted over. Yeah, I know, vain. I should just shave it really short and dye it blue. That&apos;s what Grover would do.